Conn. B.J. & Damas. K.Q. An Internet site giving good descriptions of the trees of Papua New Guinea. The tree is sometimes harvested from the wild for its wood, which is traded. Only a part of the flora, but an excellent publication in 3 volumes. It can be downloaded from the internet. 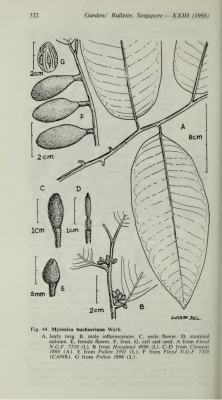 A dioecious species, both male and female forms need to be grown if seed is required. Forest Research Institute Malaysia; Kuala Lumpur. A flora of the woody plants of Sabah and Sarawak on the island of Borneo, often giving details of plant uses. A botanical journal, this one contains a revision of the genus Myristica. ]. Grow the young plants on in a shady position, planting them out in their permanent positions when large enough.